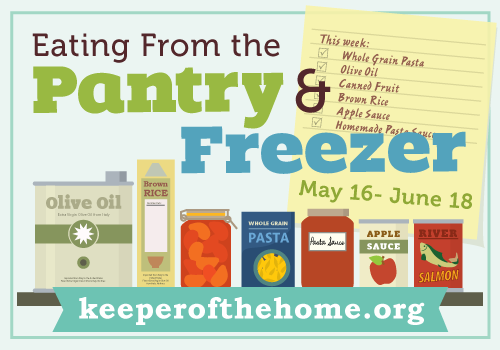 Lately, we’ve been busy clearing out the freezer and pantry (planning, week 1, week 2) while not neglecting our garden and the seasonal deals on fruit. To tell the truth, we’ve been eating like kings. For example, here’s what we had for supper yesterday, all from the freezer, the pantry, or the garden: curried oven-fried chicken, sauerkraut potatoes, stir-fried onions, asparagus, and radishes. The chicken we bought as a discounted item a while ago, the sauerkraut was the last one of our home-made frozen packages, the potatoes really needed to be eaten (or planted), our pantry was full of sale-price onions, and we picked the asparagus and radishes from the garden. We had pumpkin slice twice in the past week and ate all sorts of meat from the freezer. We’ve enjoyed the most delicious tomato-beef soup, onion soup, and gazpacho. Because pineapples and strawberries have been on sale, and because it’s cherry season, we have not eaten much fruit from the freezer this past week. And now our own strawberry plants are ripening as well. Yum! Eat more meat from the freezer. Eat some frozen squash and tomatoes, and make cauliflower soup. Eat frozen fruit—we still have a lot of raspberries, elderberries, plums, and apple slices. Make a decision about the small amount of molasses left in an old 5 gallon pail we once bought. Get rid of ‘pretty’ glass jars unless we can find a use for them. We only use real canning jars for canning, and we store our herbs in the dark, so those pretty jars aren’t much good to us. I was hoping to empty one of our freezers by the end of the Eating From the Pantry and Freezer Challenge but that will probably not happen. Even so, we’ll keep on trying, because both the eating and the savings are great. How do you manage your food stores? 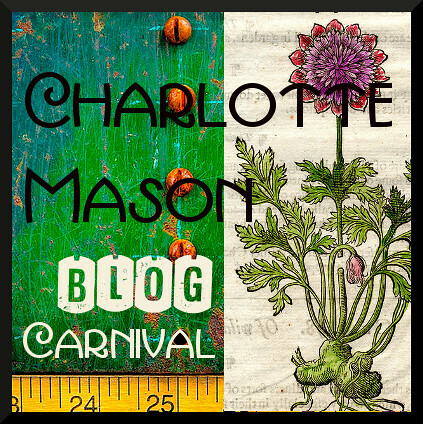 –For more kitchen inspiration, see Workin’ It Mondays, Homesteader Blog Carnival, No Ordinary Blog Hop, Sustainable Ways, Encourage One Another Wednesday, Women Living Well Wednesdays, Works For Me Wednesday , Raising Homemakers, Simple Lives, and Frugal Friday. Could you share your recipe for curried oven-fried chicken? That sounds delicious!! You’re right, it is delicious. Also, your recipe for sauerkraut potatoes? I have some sauerkraut that needs to be used. Sauerkraut potatoes are super-easy. All you do is boil the potatoes, add the sauerkraut when the potatoes are cooked, warm it all up, and mash. I usually drain some of the potato cooking liquid but add all the sauerkraut liquid until it’s the consistency I want. You could add milk and butter, but we never do. In fact, I think if you’d add milk the sourness of the sauerkraut would curdle it. Traditionally, you cook sausages with the potatoes, remove them before mashing, and serve on top. We rarely do that. how about using the pretty jars for items in the bathroom or laundry room or craft room. Or can they be filled with small gift items for teachers, grandparents, etc. Hm, right now we don’t have any food stores! I’m so proud of you guys for doing so great with emptying your freezer! How cool to read about it, thank you for sharing over at Workin’ It Mondays 🙂 I’m working on meal planning and learning to cook better for my husband and I- we’re up to making a big meal on the weekend for that week’s lunches! That’s my foodie project for now. I do something similar every once in a while and trying to only use what is in the freezer/cupboards. It meant this week the only meat I needed to buy was bacon & ham. Most other items I have already are staples in the cupboard (tomatoes, pasta, etc), so the shopping bill becomes lower, which is good. I’m growing different fruit & veg in the garden but none of it is yet at the stage of harvesting, but it won’t be long! A great challenge idea. I have an upright freezer that needs to be defrosted this summer so I will do the challenge too then hope I remember to defrost before buying! Thanks for sharing with us at NOBH.